The introduction of Android Oreo last year brought along a lot of thoughtful little changes that make the user-experience a whole lot more enjoyable. One of those new features is a native picture-in-picture (PiP) mode that allows users to tuck away the current window to a corner while switching to another app. The shrunk-down window can then be moved around from one area on the screen to another as need be. The feature is available for third-party developers to implement, and as you’d imagine, Google has taken the lead in implementing it in a number of its popular apps, including Google Maps, desktop Chrome, YouTube and more. However, third-party apps have also now started to implement the feature, with WhatsApp now believed to be working on the new feature for Android. According to WABetaInfo, the messaging app recently submitted a new update through the ‘Google Play Beta Program’, bringing the version up to 2.18.234. Once rolled out publicly, the feature is expected to allow users to continue their video calls on a minimized screen while browsing through the rest of their conversation. “WhatsApp is working very hard for past many months in order to add this feature, adding new improvements in the next updates. 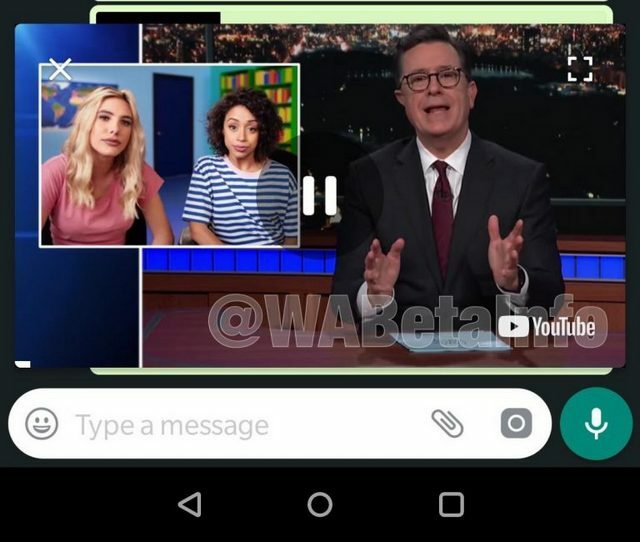 After implementing the feature on WhatsApp for iOS, we can finally affirm it will be possible, in the next updates, to view YouTube and Instagram videos in WhatsApp, using the Picture-in-Picture mode”, WABetaInfo reported late on Thursday. However, the feature is not available to users for development reasons and it needs to get many other improvements before it is officially enabled for all WhatsApp users. “For this reason, it’s ok if you have updated your WhatsApp version and it’s not working for you”, the report added.